ANCHORAGE, Alaska (AP) — Northern sea otters, once hunted to the brink of extinction along Alaska’s Panhandle, have made a spectacular comeback by gobbling some of the state’s finest seafood — and fishermen are not happy about the competition. Sea otters dive for red sea urchins, geoduck clams, sea cucumbers — delicacies in Asia markets — plus prized Dungeness crab. They then carry their meals to the surface and float on their backs as they eat, sometimes using rocks to crack open clams and crab. The furry marine mammals, which grow as large as 100 pounds (45 kilograms), eat the equivalent of a quarter of their weight each day. Phil Doherty, head of the Southeast Alaska Regional Dive Fisheries Association, is working to save the livelihood of 200 southeast Alaska fishermen and a $10 million industry but faces an uphill struggle against an opponent that looks like a cuddly plush toy. Fishermen have watched their harvest shrink as sea otters spread and colonize, Doherty said. Divers once annually harvested 6 million pounds (2.7 million kilograms) of red sea urchins. The recent quota has been less than 1 million pounds (454,000 kilograms). “We’ve seen a multimillion-dollar fishery in sea urchins pretty much go away,” he said. Jeremy Leighton of Ketchikan dives for sea urchins from his boat. He looks for plump specimens 3.5 to 4.5 inches (9-11.4 centimeters) in diameter, making sure they’re not too big. “If it’s like a cow tongue, it just doesn’t fit on a sushi roll,” Leighton said. In a bed holding 50,000 pounds (22,680 kilograms) of the spiny shellfish, he might harvest 10 percent. Sea otters are not as discriminating. If sea otters have discovered the bed, Leighton finds broken shells on the ocean floor and a handful of sea urchins hidden in rock crannies. “That’s when you know you’re in trouble,” he said. “Sea otters are still colonizing southeast (Alaska) and are significantly below ‘carrying capacity’ down there,” Lemons said. Carrying capacity is the number of animals a region can support without environmental degradation. The agency could develop local management plans within the region with Alaska Natives to protect the catch of subsistence shellfish, which traditionally has included crab, clams, abalone and other species. Sea otters are the largest members of the weasel family. To stay warm, they rely on the densest fur on the planet. Their luxurious pelts made them a target for hunters, starting with Vitus Bering as he explored the North Pacific in the 1700s. Russian and U.S. hunters over 150 years virtually wiped out sea otters until the signing of an international treaty to protect northern fur seals and sea otters in 1911. In the 1960s, Alaska’s wildlife agency moved more than 400 sea otters from the Aleutian Islands to southeast Alaska to reintroduce them to their historic range. A count in 2000 estimated 12,000 animals. The last count in 2012 estimated 27,500 animals, a growth rate of 12 to 14 percent annually. Fishermen fear the population will double again in six years. Hunting is one of the only checks on sea otters, but under federal law, only coastal Alaska Natives can kill them. There’s no season or bag limit, but federal rules severely restrict how pelts may be used. 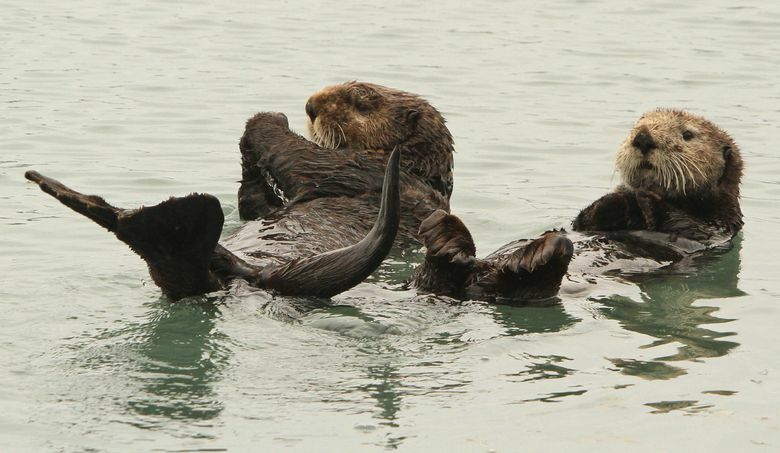 There’s not much incentive now to hunt sea otters. But at the urging of fishermen, Alaska’s state Senate recently passed a resolution asking Congress to amend federal law to allow sale of pelts without restriction. Native artisans and hunters have a financial interest in maintaining a robust sea otter population, Lemons said. What’s more, he said, sea otters help the ecosystem by eliminating predators that eat kelp and sea grass, which provide habitat for finfish such as herring. But Doherty of the dive fishing association says the industry and otters can’t co-exist, given their current growth trajectory. 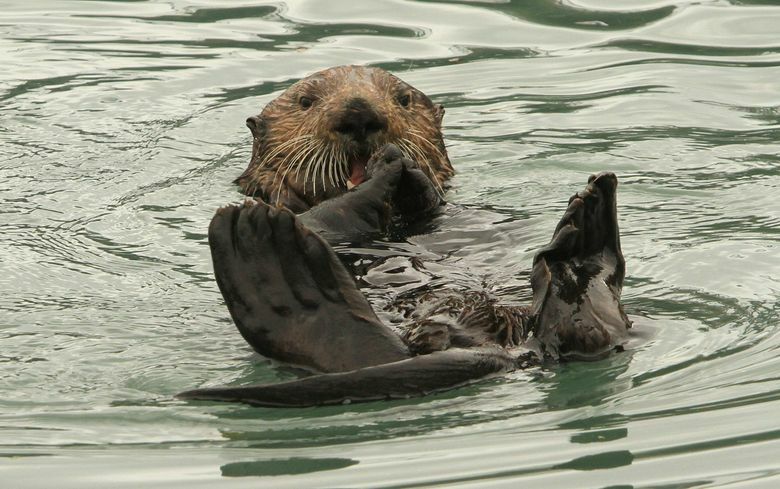 “You can’t do it at a level where sea otters increase 13 percent every given year,” he said.